With a wingspan of over a metre, this is Australia's largest bat. 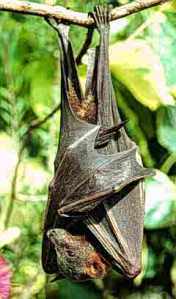 Like most of the other flying fox, It has a loud, crying call, like a spoiled baby screaming in a cartoon. It is found in mangroves and forests along the tropical coast extending down the west coast to Shark Bay and down the east coast to northern N.S.W. It is also found outside Australia, stretching into New Guinea and some of the islands of south-east Asia (Strahan 1998). This bat can generally be found by day in huge noisy, smelly camps in mangroves or forests. At dusk, especially in the tropics, one can see huge numbers of them fly across the darkening sky to feed.